Are you familiar with the Jewish holiday of Purim? It celebrates the story of the book of Esther, and it just ended. There are traditional observances (e.g. dressing up in costumes and hearing the book of Esther read), giving to charity, and general frivolity. And of course, eating traditional foods…in this case a triangular-shaped cookie usually filled with jam, prunes, or poppy seeds called Hamantaschen (called that because they mock the villain’s hat, or ear, or pocket…depending on the translation you read). You see them in bakeries regardless of faith, geography, or the time of year, and for good reason…they’re delicious! There are, of course, many different types of hamantaschen dough, but the most common starts as a butter cookie. You can substitute butter with another non-dairy or vegan-approved fat (depending on your dietary needs), and I’ve seen dough with cream cheese used instead of or in addition to butter. 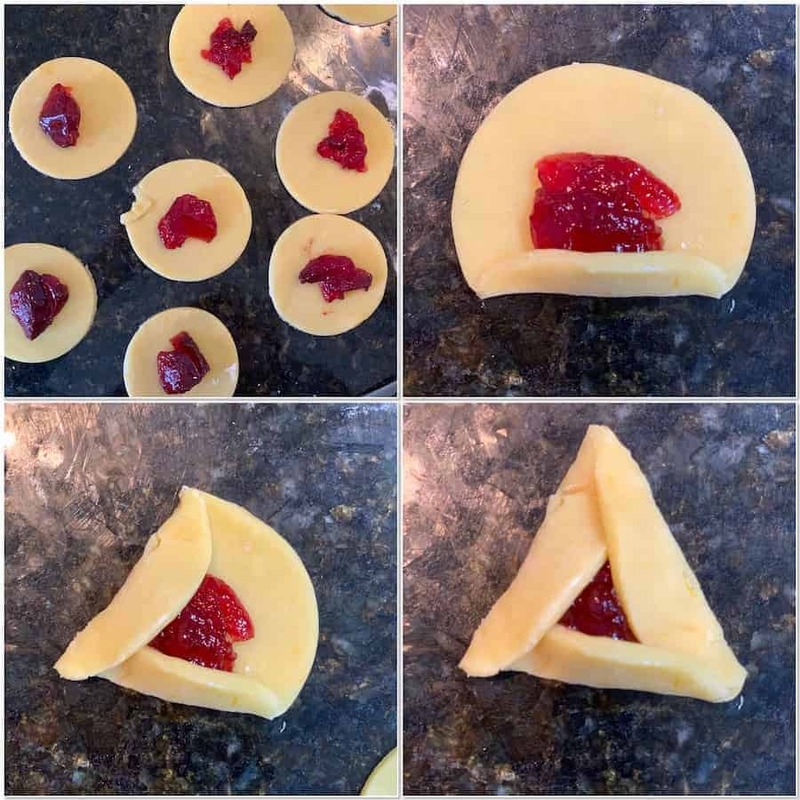 However you make it, the dough is chilled, rolled out, cut into circles, topped with a dollop of filling, then shaped into their customary triangular shape before baking. Kind of like hand-held jam tarts. The hamantaschen recipe I like best is Tori Avery’s butter cookie version. Hers have great flavor (not plastic-y or flavorless like some hamantaschen can be), and she’s got easy-to-understand instructions on the best way to shape them (Tory also has lots of recipes for various types of fillings and a dairy-free hamantaschen recipe if you’d prefer). My older daughter & I made the hamantaschen in stages…I made the dough in the morning, and we assembled and baked them in the afternoon. All ready for Purim! Slice room temperature butter into small chunks and place in a large mixing bowl. Add sugar to the bowl, and, using an electric mixer, cream the butter and sugar together for a few minutes until light and fluffy. Sift flour and salt into the bowl. 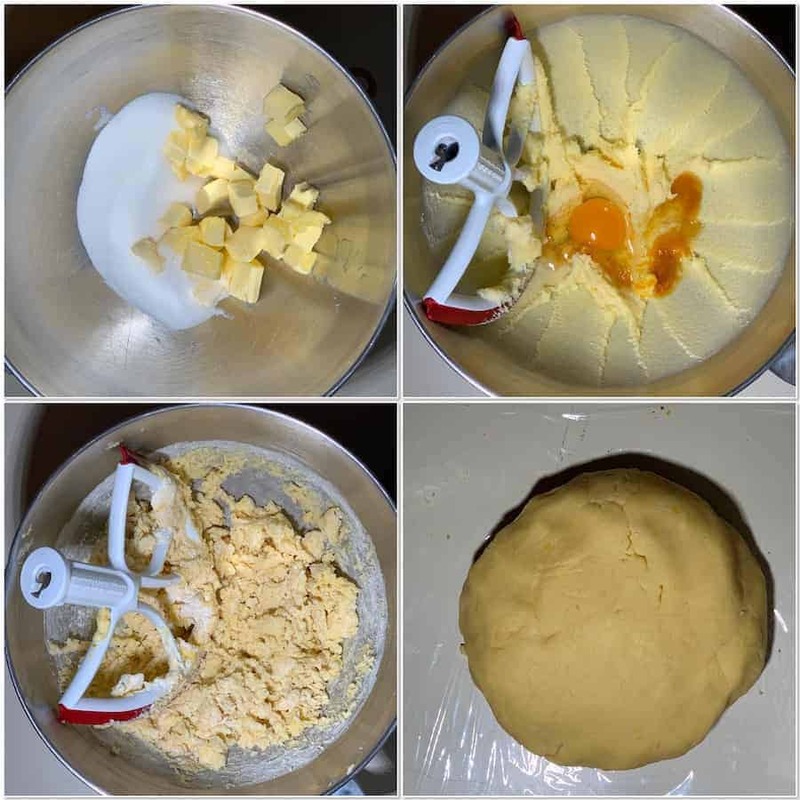 Mix with the electric mixer on low speed until it comes together into a crumbly dough. Knead the dough with your hands until you get a smooth dough. See Recipe Notes for helpful tips. Before you begin to assemble the hamantaschen, choose your filling and have it on hand. Preheat oven to 350°F. Use a rolling pin to roll the dough out to 1/4-inch thick. At the beginning, it will be tough to roll out (you may need to pound it a bit). As you roll, cracks may form on the edges of the dough. Repair any large cracks with your fingers and continue rolling. When the dough reaches 1/4-inch thickness, scrape the dough up with a pastry bench scraper, lightly flour the surface, and flip the dough over. Continue rolling the dough out very thin (about 1/8-inch thick (see Recipe Notes for tips about dough thickness). Lightly flour the rolling pin occasionally to prevent sticking. Chill the dough in the refrigerator 5 minutes to firm up before cutting your circles (this step is where I start getting impatient). 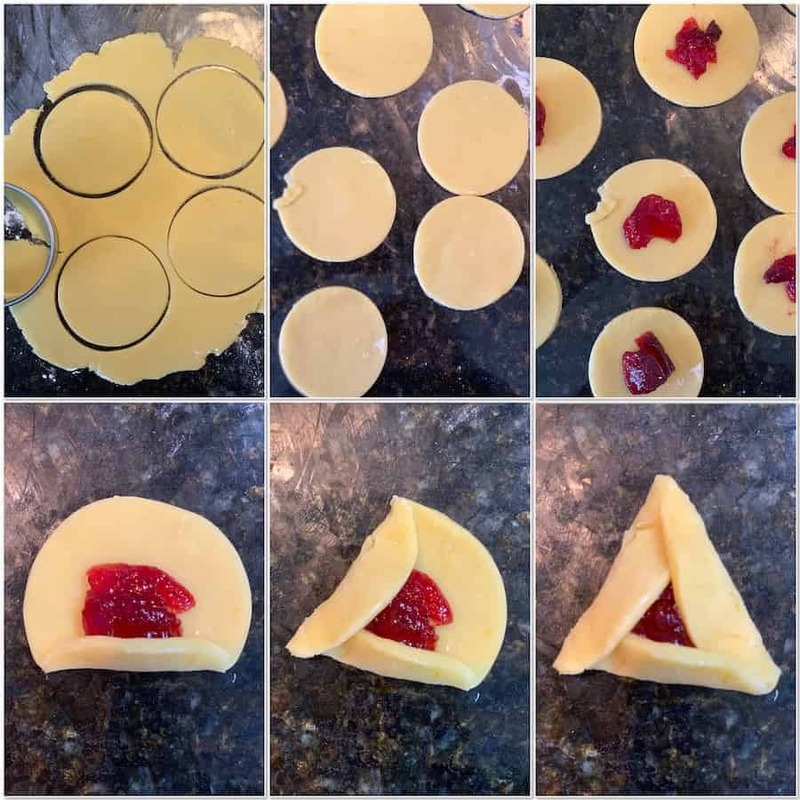 Use a 3-inch cookie cutter (not smaller) or the 3-inch rim of a glass to cut circles out of the dough, cutting as many as you can from the dough. Gather the scraps, roll and cut them out again. Chill the circles in the refrigerator for about 5 minutes (again…impatient). Working with a few circles at a time, place a teaspoon of filling into the center of each circle. Do not use more than a teaspoon of filling, or you run the risk of your hamantaschen opening and filling spilling out during baking. Grasp the left side of the circle and fold it towards the center to make a flap that covers the left third of the circle. Grasp the right side of the circle and fold it towards the center, overlapping the upper part of the left side flap to create a triangular tip at the top of the circle. A small triangle of filling should still be visible in the center. Grasp the bottom part of the circle and fold it upward to create a third flap and complete the triangle. When you fold this flap up, be sure to tuck the left side of this new flap underneath the left side of the triangle, while letting the right side of this new flap overlap the right side of the triangle. This way, each side of your triangle has a corner that folds over and a corner that folds under (it creates a "pinwheel" effect). This method if folding is not only pretty, it will help to keep the cookies from opening while they bake. When all of your hamantaschen have been filled, chill them for about 5-10 minutes before baking (need I say it? And yet, it really helps keeping the hamantaschen in shape as they bake). Place the hamantaschen on a lightly greased baking sheet, evenly spaced, and bake for 20-25 minutes until cooked through and lightly golden. Cool the cookies on a wire rack. Store them in a tightly sealed plastic bag or container. Try not to overwork the dough, only knead until the dough is the right consistency. If the crumbles are too dry to form a smooth dough, add water slowly, 1 teaspoonat a time, using your hands to knead the liquid into the dough. Knead and add liquid until the dough is smooth and slightly tacky to the touch (not sticky), with a consistency that is right for rolling out. It can easily go from the right consistency to too wet/sticky, so add water very slowly. If the dough seems too wet, knead in a little flour till it reaches the right texture. The thinner you roll the dough, the more delicate and crisp the cookies will turn out…just make sure that the dough is still thick enough to hold the filling and its shape. If you prefer a thicker, more doughy texture to your cookies (less delicate), keep the dough closer to 1/4-inch thick (that's what I did and it worked better for me). If you’re using store-bought filling, make sure it’s good quality as the taste will be featured against the butter flavor. You usually see apricot, raspberry, prune, or poppy seed fillings, but sometimes chocolate or another filling flavor pop up (Nutella? Peanut Butter & Jelly?). This year I used a raspberry wine jelly from Plymouth Bay Winery called Bad Newz…it’s made with their raspberry wine and flavored with dark chocolate (two flavors that definitely go together!). 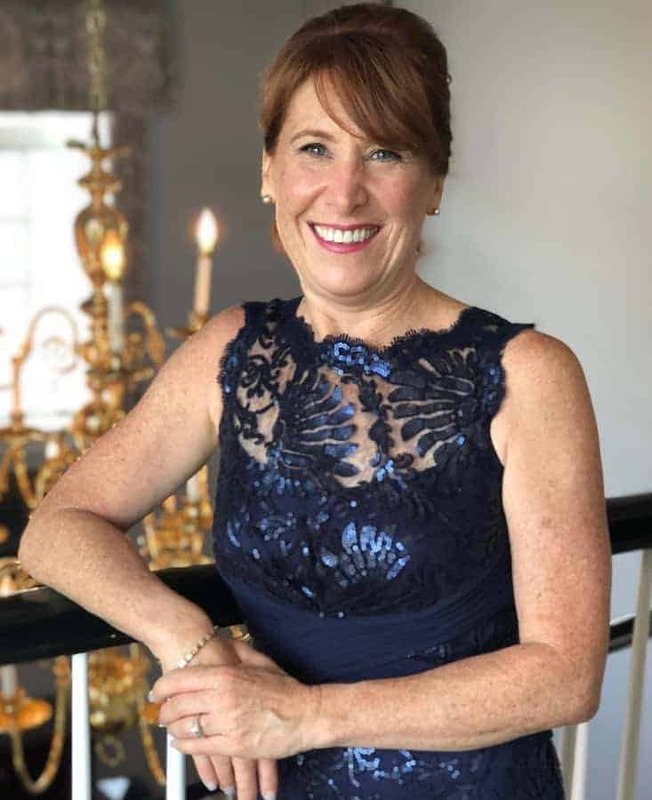 My older daughter and her husband went to the winery last weekend for her birthday and brought me back the jam along with tales of their fruit wines and jellies…I’m looking forward to tasting more of their products.